Want a nice sound without a full system (or it's cost)? You can get a Cobra F1S slip-on for ~$170. But slip-on means cut the header pipe with a hacksaw and then slip-on. Its pretty simple after you cut the pipe but I'd hardly say the pipe "slipped" on. I had to wrestle and whack it on. Result: nice sound, low and rumbly, nice bass note, like a twin should sound. Most people like them. It roars at high RPM and its mellow at low. I'm happy with it. You do not need to re-jet, but it will run better if you do. This muffler will do nothing for performance but will make it sound better. Note that there was one comment about having an engine stutter at constant throttle highway speeds, likely due to needing jets (running lean). The quality of the Yoshimura is in a different league, far superior (it's also $300+). V&H with snout pipe is a distant second, D&D and Kerker are a close 3rd and Cobras are 4th or further down, No experience with cobra noise levels so no idea there. V&H is moderately noisy at idle and moderately noisy at high rpm. Not offensive because the pitch is quite nice, like a stretched leather drum being banged. Yosh is louder than the V&H at low rpm but quieter at high rpm and same sort of noise; quiet, low pitched. D&D is fairly quiet at low rpm and extremely loud at high rpm. Further the noise was higher pitched and it set my ears ringing in a few minutes of revving standing next to it. At higher rpm when standing next to it felt like someone had shoved a skewer in my ear and was scratching the back of my skull; lots of high-pitched noise. Carbon fiber cans are actually quieter than metal ones. 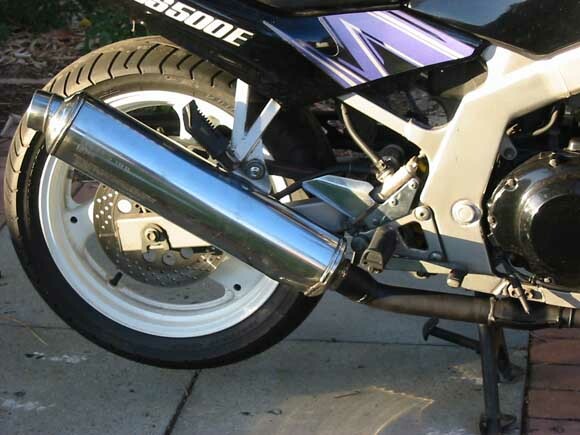 As long as the muffler/slip-on doesn't have a flange with 3 or 4 bolts its quite easy to fit it on a GS. That slide on stuff is easy. Any slip on for any bike will do actually. I've heard that slip-ons for Suzuki DR650 off road motorcycle will fit on GS500 because the DR650 has a 2" dia. inlet pipe and this may match the GS's pipe. Not confirmed. Micron makes one for the DR650. Stock SV650 exhaust welded to GS pipes-aesthetic only. Special thanks to Srinath and others from GStwin.com. Special thanks to Lee McDonald for the Sv exhaust picture.